Adirondack Lifestyle ™: Guess Who's Coming to Dinner - a la Adirondacks! Guess Who's Coming to Dinner - a la Adirondacks! My friend the beautiful doe joined us for dinner this evening on the deck at the homestead. I know it might seem weird to you folks in the 'burbs that I am so excited about having a deer friend hang around my house. 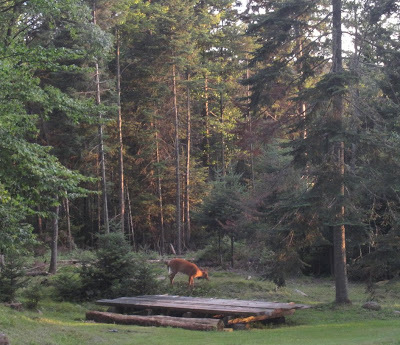 Deer are not a nuisance in the Adirondacks. As a matter of fact, I am giddy about having my quadruped guest because I have barely caught a glimpse of a deer in our yard in the twenty-two years I have lived here. Having hunted deer, I know they are extremely skittish. My doe friend, however, does not seem to mind us humans and I think she really likes the music.